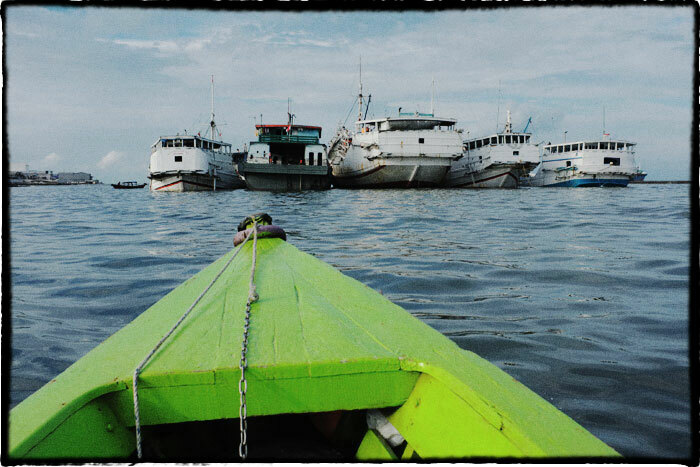 It had been years since the last time I came to the old port of Sunda Kelapa. Few things had changed then. It became more organized and looked a little bit cleaner. 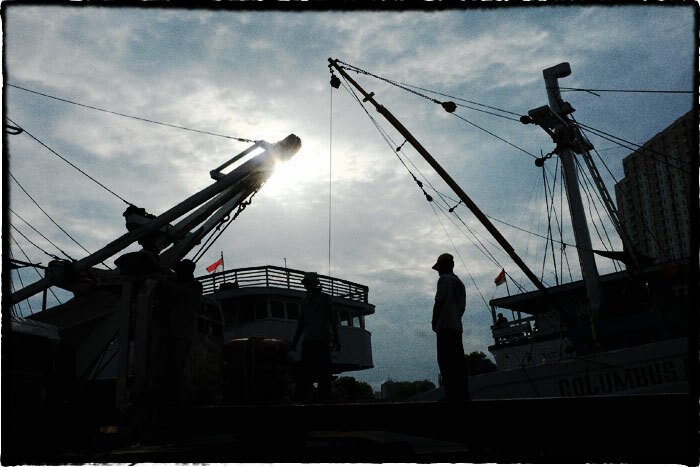 Many centuries ago, this old port played a significant role as a trading hub and most importantly, the main entrance of Batavia (Jakarta). 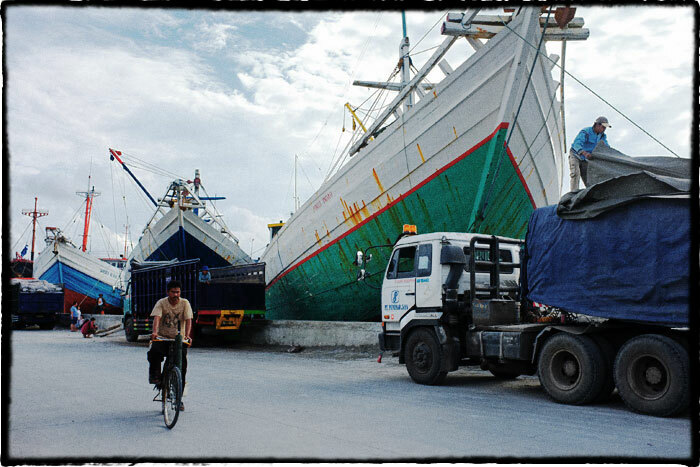 Today, it no longer becomes a bustling port like it used to. 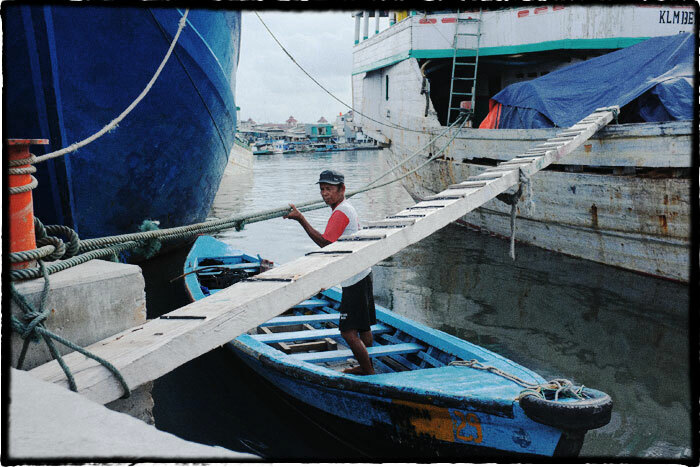 No more big ships loaded with spices from Moluccas, or ceramics and silk from China, sailed along the port’s canal. Yet, escaping the past is not as too easy as we may think. Strolling along the dock in one bright afternoon, I found some loading activity. Most commodity found in this port nowadays were building materials like cement, sand, timber, and reinforcing steel bar. The ships might have still made of timbers, but everything on it were then operated by engine. 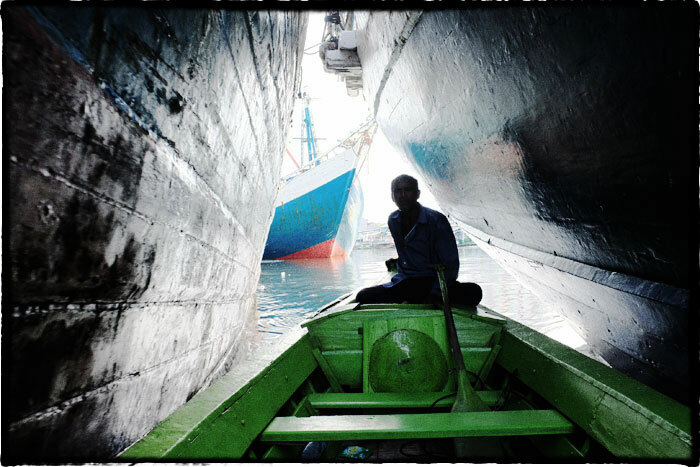 As one of tourist places in Jakarta, this port was actually lack of attraction. 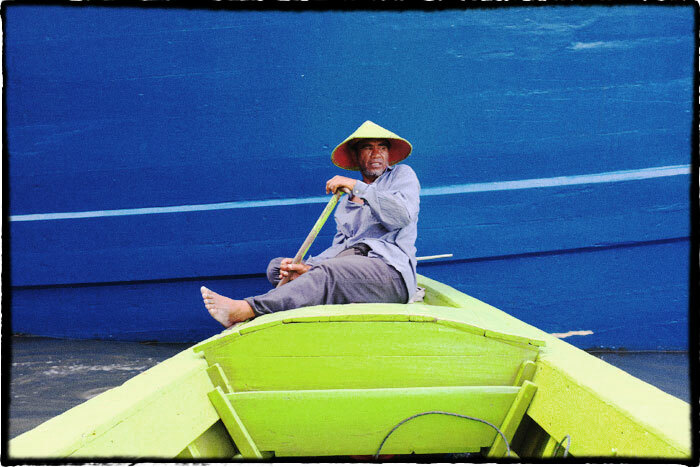 What else would tourist see beside those wooden ships painted with striking colors? What made me concerned most was there was no proper information I could find on the spot about the history of this port. However, it was good to know that they had then provided tourists with public portable toilets and a convenient store where we could buy cold beverages. Yes, it took two bottles of medium mineral water to quench my thirst that hot afternoon. I noticed that capturing the impression of old port was not as easy as it had used to. With the high rise apartment buildings constructed right across the port canal, I was nearly desperate to find the angles to take the pictures. I guess everyone who had been to this port was familiar with some old men offering boat riding. I could say that this was the only attraction every tourist could have in this port. It was not for free of course, and they didn’t have standard fixed price for the ride. But the good news was you could negotiate with the men, and if you come with companies, you might get a better price for the ride. Normally, I never wanted to ride the boat anymore as I had done it twice few years before. But wanting to capture the port from another angle made me make a deal with one of the men. Since I came alone, I had to bargain a little bit harder with the man. I asked him to drive along the canal until the entrance gate of the port which was located right before the Java Sea. At last, we had a deal at the price of fifty thousand rupiah for a ride. I completely forgot the name of this man. But I could recall that he was the one driving the boat nine years earlier when I had my very first boat riding in this port. 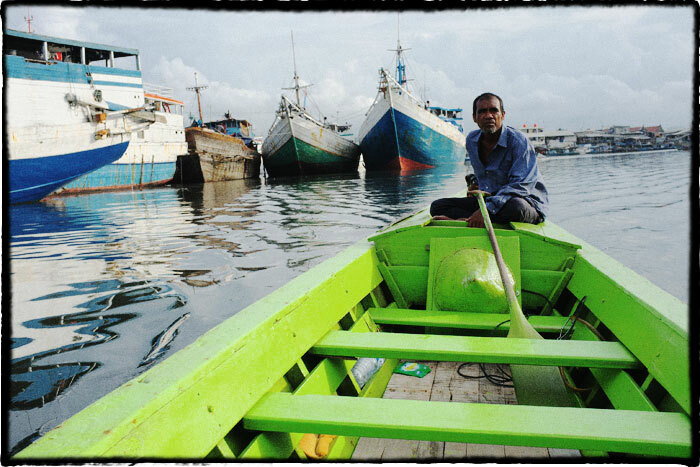 He came from South Celebes and lived at Kampong Luar Batang, an old settlement located right across the port. First, he managed to drive the boat through the big ships. It was quite an experience to be in between those floating giants. 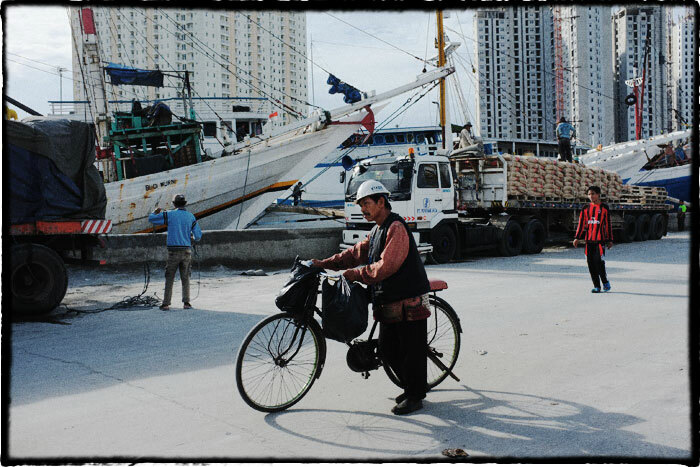 Soon as we reached the port’s canal, he turned from driving manually with a pedal to driving with an engine. It was enjoyable to see the ships at the old port from the canal. Sometimes I asked the man to slow down so I could see the ship more carefully. 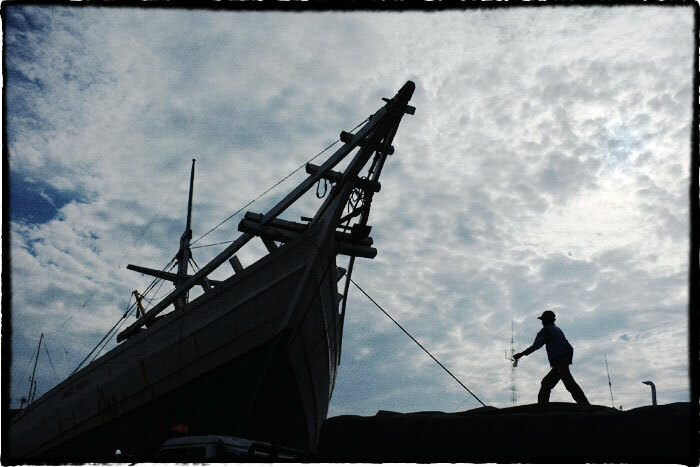 Finally, the boat nearly reached the Java Sea. The wave was a bit high that afternoon and it was not save for such a small wooden boat. So we decided to detour and return to the dock. I was suddenly amazed with what I saw. It was more like a picture of what the sailors centuries ago saw when they were about to reach the port with their boat. Well, maybe I exaggerated but that was a scene I had never seen before. To add the sense of old, I touched the photographs I had taken with a photoshop filter that emulated the look of Kodachrome. I was glad that despite of the rapid development around this old port, I could still see its past, even though I had to pay extra for the boat riding.